The two Nigels drivers on Hobart Sightseeing Coach Tram and Port Arthur Tour are so great! Both Nigels have very good knowledge about Hobart and provided us with many stories. Many thanks. Overall a pleasant trip which gave me a pretty good idea of the main characters of Hobart. Neil was professional and had a good sense of humor. Would have been better had we had the luck popping on the good old tram coach though! 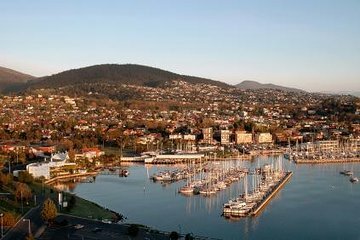 Our experience in Hobart and the trip to Port Arthur were wonderful! Our tour guide/bus driver, Adam, was personable and relayed so much interesting history of the city to us in a way that you could tell how much he loved his home city of Hobart. The day trip to Port Arthur was also interesting and enjoyable as was the 90 minute bus drive to Port Arthur and the trip back. Our driver served us with lots of interesting information as well. We really would have stayed in Hobart/Tasmania longer had our schedule allowed for it. I would rate our tour 5 out of 5! The tours were easy to book, efficient and well worth the price. The tours were great and were completed over two days, on the first day we were shown the sites of Hobart and on Day two we were taken to Port Arthur, both tours were very informative and enjoyable, both coach drivers, one on each day, were also our guides on each day, both were pleasant, very knowledgeable, friendly and very helpful where necessary. Definitely worth the price and would gladly book using viator in the future. Excellent. Half day Hobart tram tour was a little rushed. Having said this we saw and learned much more of Hobart than expected if we had done on our own. We returned to several sites later in our own time. Port Arthur tour is a full day. We didn't rush around, visiting only half the site before sitting down for an awesome lunch in the cafe before boat and Isle of the dead tours. Looking forward to return visit to complete tour. Both drivers were also our tour guides and where knowledgeable and informative with both history and local topics providing excellent commentary. Both captains cannot praise enough. Highly recommend both bus tours.